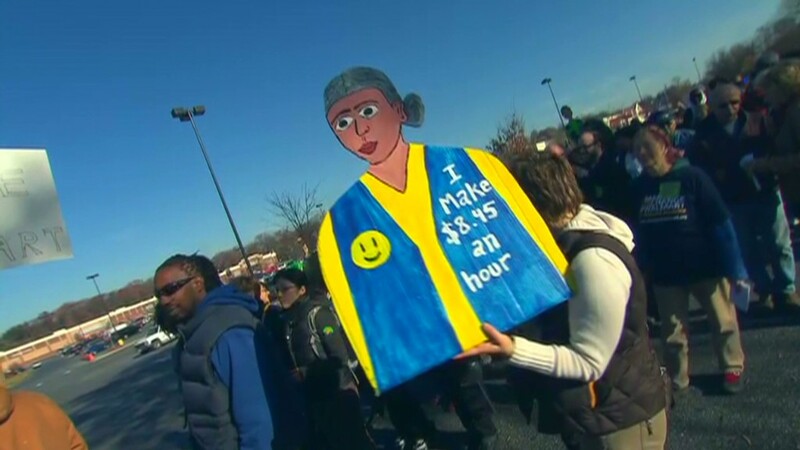 Hundreds of people -- including some employees -- have taken part in Black Friday demonstrations at Wal-Mart stores nationwide, protesting what they say is the retailer's retaliation against speaking out for better pay, fair schedules and affordable health care. According to organizers from the union-backed group OUR Walmart, hundreds of workers and thousands of supporters rallied across 100 cities, including Landover Hills, Md., Miami, Oakland, Calif., Chicago, Danville, Ky., Dallas and Kenosha, Wis. In one of the biggest protests, nine people were arrested outside of a Paramount, Calif., Wal-Mart store for failing to disperse, according to a Los Angeles County Sheriff's Department statement. An OUR Walmart spokesman said three of those arrested were Wal-Mart workers. Those arrested were to be released without bail, unless they had previous arrest warrants. The sheriff's department said about 1,000 people arrived by bus and private vehicles to participate in the Paramount protest, which was characterized as peaceful. In Landover Hills, near Washington. D.C. ,organizers said about 350 people participated, although video of the event showed around 100 participants. Dawn Le, who works for the United Food and Commercial Workers Union, which backs OUR Walmart, would not say how many of those taking part were Wal-Mart employees. Wal-Mart (WMT), in a statement late Friday, said worker absenteeism was down more than 60% from last year. "We had our best Black Friday ever and OUR Walmart was unable to recruit more than a small number of associates to participate in these made for TV events," said David Tovar, vice president of corporate communications, in the statement. "Press reports are now exposing what we have said all along -- the large majority of protesters aren't even Walmart workers." Janna Pea, an OUR Wal-Mart organizer in Dallas, said about 40 workers and about 150 supporters took part in a protest Thursday night. One of those with her was Josue Mata, who says he walked off his job as an overnight maintenance employee to protest retaliation against people who want to speak out. "I have four kids and I don't want them to grown up in a society where people disrespect them," he said. "This is a never-ending fight and we're never going to stop." Related: Wal-Mart: Crowded, and not everyone is smiling. Mata said he plans to return to work for his next scheduled shift on Sunday evening. 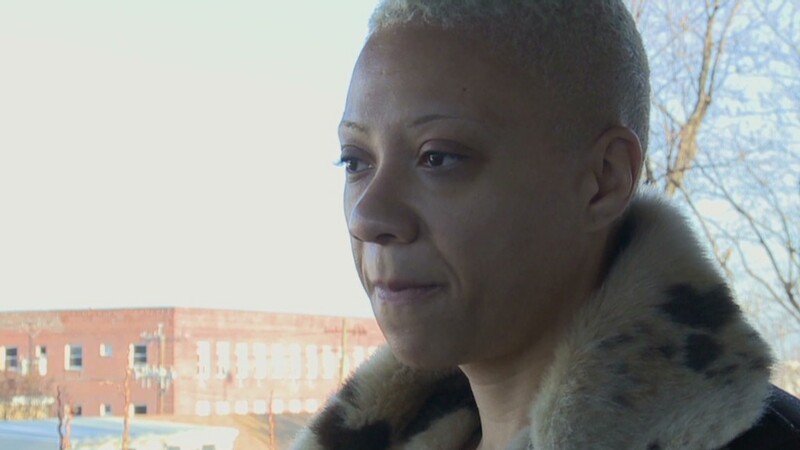 Pea said her protesters went to four Wal-Mart stores across the Dallas area, and while they were able to picket and speak to customers at half of them, they were asked to leave immediately by police at the others. "We were still able to talk to customers and educate them about what was going on," she said. "We saw one person who was planning to go shopping, but then didn't end up going in. Instead, they rallied with us." Muhammed Malik, who helped organize a protest at a Miami Wal-Mart, said roughly 70 workers participated in their hour-long demonstration Thursday night. He said one worker walked off his shift as he saw others rallying outside. Wal-Mart has denied that it has retaliated against protesting workers, and said Friday that it has offered special holiday discounts to its employees for their efforts this season. The protests were limited in scope, occurring at a handful of the company's approximately 4,000 U.S. stores. One employee at a store near Pittsburgh told CNNMoney he had heard of the protests only through the media. In an effort to stop the protests, Wal-Mart filed a complaint last week with the National Labor Relations Board, claiming that the demonstrations violated labor laws. The retailer said the actions have disrupted business, and that the workers' ongoing actions violate the National Labor Relations Act, which prohibits picketing for any period over 30 days without filing a petition to form a union. On Tuesday, OUR Walmart filed its own charge with the federal agency, claiming that Wal-Mart tried to deter workers from participating in the protests and interfered with their right to speak up. But the NLRB was not able to rule in time or issue an injunction. Nancy Cleeland, a spokeswoman for the NLRB, said the complaint is too complex to make a ruling so soon. Despite the talk of the protests, Wal-Mart reported larger Thanksgiving and Black Friday crowds than last year. As of Friday morning, the company said it had processed nearly 10 million register transactions. Shares of Wal-Mart rose 1.9% in Friday trading.